Tonight was the first of (hopefully many annual) Beermas gatherings. Us Aleanders (a branch of the Brewnosers) gathered tonight at the workplace of one of our members, the tripling-in-size Gahan Brewery. 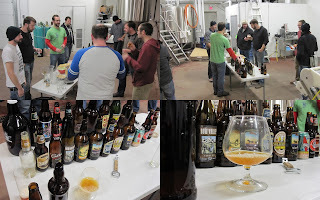 Akin to Festivus, there were a couple of Beermas miracles: the fact that there was snow (in this time of global warming), and that we got to hold our meeting at a brewery. (Unfortunately?) There were no feats of strength or airing of grievances. A few of the best brews (in my opinion) were Bear Republic's Red Rocket Ale, the Houblon Chouffe Dobbelen IPA Tripel, Stone's Cali-Belgique Belgian IPA, St. Ambroise's RIS, and some really different winter ales. There were also some tasty home brews from Hogie and Wortly, as well as newcomer Devin (from the far away land of Stratford). Looks like a great turnout! Pretty Sweet! Nice work on the gathering! The love the red rocket....have you had the opportunity to sample the Racer 5 IPA? Its a delicious west-coast IPA. I am constantly amazed at the ingenuity of the Aleanders to gather international craft beer to sample on the island. When the wife and I return in Feb (I hope) I would like to offer something to boys. I really got onto hop-heavy beers this summer... kind of by accident, too. This ACME brew by California's North Coast Brewing Company is from one of my visits this summer to Premier Wine & Spirits in Halifax. It has a nice golden copper colour that clears after a couple of minutes. Its white head is decent. It keeps a 2mm skim of head on top and an inch or so of lacing follows it down to the bottom. I was expecting more from the smell, given previous brews I had on my recent IPA kick. It's not very fragrant. I get a bit of orange and malt / caramel. The taste is less than I expected, too. It tastes like a bit of orange, and a little of something like peach/mango/papaya, added to an amber or red ale. Not as refreshing and light as I thought, but pretty good. Aftertaste has a bit of apricot. Not too far from where the old Spring Park Brewery used to be in Charlottetown is PEI's newest craft brewery - Upstreet Craft Brewing. A sign will go out tomorrow, and the Facetwittergram machine will fire up, too, but tonight... I am lucky to be able to have the scoop (thanks, guys) and introduce PEI's third brewery. I did a semi-formal Q-and-A with Upstreet's head brewer (as well as fellow Aleander and Brewnoser) Michael Hogan (who is joined in the venture by Joey Seaman and Mitch Cobb). I hope we have complied all (or at least almost all) of what you would want to know. PEIBG: When's your planned opening date? MH:It’s looking like a May opening. We plan to have a soft opening with two beers released, followed by a grand opening, with an additional two beers.